Our community is truly fantastic! Everyone asks such great questions, which create amazing discussion! FAQ (Frequently Asked Questions) Friday has been extremely revealing! In last weeks FAQ Friday we answered some amazing questions and this has sparked todays video! In our last Feedback Friday episode we got asked a lot of questions about drums. One question in particular was asking about using programmed drums and making them sound good. In this song not only is it finger drums, but there are no cymbals! So if we can make this interesting we can do anything. If you’ve watched the last video about reverb tips you’ll notice one of the things I love is the randomness or in this case a more rhythmic approach which we can randomise. First we will take an EQ (a stock EQ works great!) and wipe off the low end. I don’t need multiple build-ups of the kick drum and I don’t need to go full Abbey Road on it either, which would be up as high as 600z on the High Pass. The top end is also big deal to reduce quite dramatically because we want to create girth, noise, and some energy down there without the high splashing around and taking our ear away from other elements in the track. Next, create a bus (auxiliary or sub group) and send from the drum group (in Pro Tools you can click option on the fader to bring it to 0db). Then choose a delay. There are tons of third party delay plug ins that already have EQ’s and effects built into them, however this is the full proof way of achieving the effect with any DAW’s stock plug ins! Now let’s mess it up! A: Randomize the timing, or B: Add saturation (in this case SansAmp which comes free with Pro Tools). The person who asked me the question on Friday was wondering how to make clinical sounding perfect drums sound rough and ready, this approach is what I use all the time with programmed Drums. At the beginning of the Delay Bus, before we do anything else, grab some kind of pitch shifting and detune. I often set one pitched up and one down. I like to set the Volume of the effect like this there’s a point where you might not hear it, but you will notice if it gets turned off. If I’m getting that result them it’s doing it’s job properly! It’s adding energy, randomness to the track and making the programmed drum elements feel less ‘clinical’ and perfect. If you get it set it pretty low, but as soon as you turn it off you notice there’s some movement missing, then you’ve got it right! I learned this from Mark Endert. He mixed some stuff for me for a movie soundtrack I did and when he mixed it he put in some subtle delays. My drum track was super clean and he just wanted to add some movement to it. – I love this trick. So we’ve got one detuned – one pitched up, one pitched down, and then we got a Delay that has nothing done to it at all. You can randomize these delays. You can change the timing- all kinds of stuff but basically it’s adding some dirt and some wrongness. That’s a great little trick on drums and frankly you can do this on any instrument. It’s just really good to randomize and mess things up! This is what we love about great records! 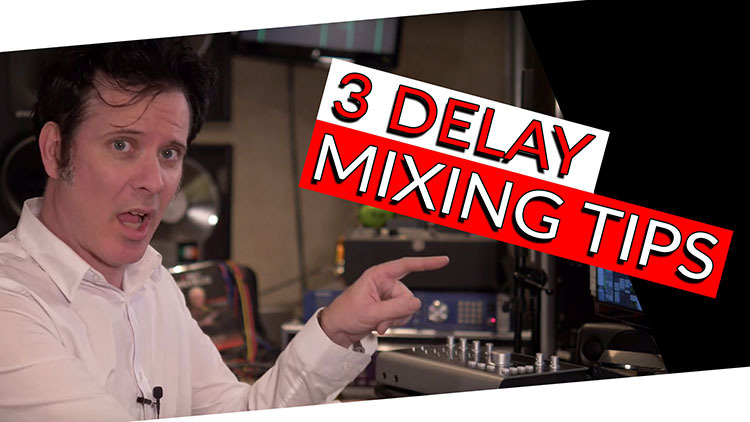 This third trick is not really a delay, but it is Delaying….well sort of!! Haha It’s a simulation of a ‘Look Ahead’ Compressor which delays the signal allowing you to control the attack and release times extremely fast! What does that mean? – haha I’ll explain. A free Plug In I’ve always loved is the Bomb Factory 76- pretty much everyone has that, it comes free with ProTools (I’m sure whatever DAW you use has great Free Plug Ins as well!). One of the problems we have, is even on the fastest attack time, the Bomb Factory 76 isn’t able to catch every single transient I want it to. Grab your compressor, put it on our main lead vocal. We are going to key it from a duplicate of the vocal. I move the duplicate vocal 20 ms earlier! How you might ask? I’m going to grab my vocal and move it 20ms to the left, and that’s now keying the compressor. – To me it sounds better immediately! Normally the fastest attack time on the 1176 is not fast enough to catch a really percussive vocal. So by doing this trick I’m now able to get 1176 to dance really nicely around the vocal despite it’s fastest attack time not being fast enough. I hope you enjoyed these three tips! and please let us know what your favorite tips & Tricks are.